Two tail "Crested Eagle" in Hamlet Ngrangkah, Umbulharjo, Sleman, Yogyakarta Special Region, on Sunday (24/10/2010)-two days before the first eruption of Mount Merapi-goods last time a eagle Crested observed Lim Wen Sin. Massive eruption of Merapi was certainly destroyed thousands of hectares of forest and gardens of the people, which is also habitat for birds on the slopes of Merapi. In addition to Crested hawk, vegetation on the south side of Merapi is also home to rare birds of Java-the-eagle before the eruption amounted to less than 10 cows. Ngrangkah Hamlet is one of the hamlet with the greatest damage. Some citizens were killed in the first eruption. Hamlet is Hamlet Kinahrejo neighbor, caretaker residence hamlet Merapi, Mbah Maridjan. "Not only bird raptor species (the predator), other birds ascertained also spread to various other locations, away from Merapi," said Lim, birdwatching activist in Indonesia Raptor Club. In addition to spread, it is quite possible some of them die, like the report fellow bird watchers see Javan hawk-eagle dying around the Ground. Birds such as orioles and Srigunting that prey on insects to be highly affected families. Even if many birds survived, we can be sure the future of dozens of bird species on the slopes of Merapi threatened. The eruption of Merapi, which burned the vegetation and slope ecosystems has a direct impact on the availability of various types of feed in the wild. If anything, other than limited, quality bird feed, such as insects, snakes, fruits, or plants, confirmed contaminated volcanic ash. Actually, hope a lot of birds on the slopes of Merapi, survivors are still there. Some reports mention the existence of a local group of birds that migrate a few days before Merapi erupted. 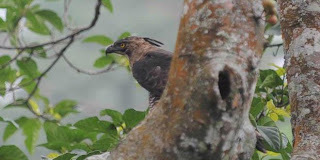 In fact, one day after the eruption, a number of other birds of prey were observed to shift to a grove of trees in the hamlet Kepuharjo, on the south and east Kinahrejo. Post-eruption of the second, Friday (11/5/2010) early days, the presence of migratory birds was not observed locally anymore. Merbabu slope region and Sindoro-Cleft in Central Java allegedly become the next local migration destination. "That will happen during any form of vegetation corridors connecting," said Lim. Even managed to arrive at a new place, competitions feed into the problem continued. In nature, he is strong who survive. In the food chain, Javan hawk-eagle and other birds of prey, such as Crested hawk, is a top predator. However, both predators and prey there was no difference in the "eye" of Merapi. And, the birds were forced to fly somewhere.